The sock in the videos is being worked over 64 stitches, 32 of which make the heel. I'm only working on 60 stitches/30 for the heel. In Part 1 I worked until I had 10 wrapped stitches on each end and 10 unwrapped stitches in the middle. In the video, Part 2, the knitter says to advance the clicker to 11 before you start picking up the wraps. To make it work for my sock, I reset the clicker to read 9, and then continued from that number. I'm participating in Project Spectrum and the color for May is red. I'm planning to make a pair of socks each month in that month's color. While it's true that my watermelon socks would fit the bill, what I really had in mind was to use what I had on hand. So, I "shopped the stash" and found this. 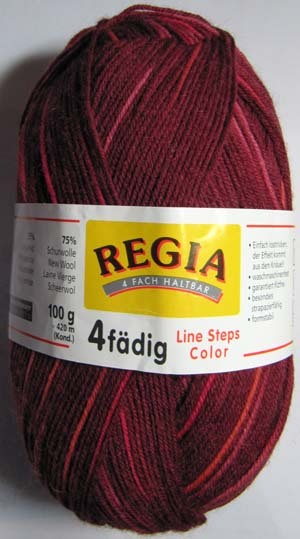 It's Regia Line Steps Color #5372, a deep red with lines of lighter reds throughout. I don't know how long it's been in my stash, but I'm guessing that it's been quite a while. Now I have to decide if I want to knit a plain pair of socks in stocking stitch and let the colors provide the interest, or will I do a patterned sock? I'm open to suggestions. The one thing I do know is that I'll make a short row heel.